Palestine won full admission into UNESCO, the United Nations science, education and cultural heritage organization, in a closely watched vote in Paris Monday. Global diplomacy hands view the 107-14 vote as a benchmark carrying larger implications for the Palestinians’ bid for state recognition before the UN Security Council. Both the United States and Israel have strongly opposed both initiatives. The United States, Israel, Canada, Germany, Sweden and Australia were among the 14 nations voting against the Palestinians’ UNESCO bid, while 107 countries–including France, Spain, Ireland, Austria, Belgium, Brazil, India, Russia, China, South Africa and Indonesia–voted in favor. Fourteen nations–including the United Kingdom and Italy–abstained. Washington, which called the UNESCO vote “premature” Monday, has threatened to cut off funding to UNESCO if Palestine is granted membership. The United States currently accounts for about one-fifth of the organization’s budget. Israel’s Ministry of Foreign Affairs also rejected the UNESCO vote, and warned it would set back peace process. Palestine’s successful UNESCO bid comes as Middle East Quartet envoy Tony Blair is due to meet with U.S. President Barack Obama at the White House Monday. Blair has been trying to advance the Quartet’s efforts to get the Israelis and Palestinians back to the negotiating table, asking each side to lay out their specific terms for resolving the issues of borders and security for a two-state solution. Meanwhile, Israeli officials have been depicting Palestinian Authority President Mahmoud Abbas as an unworthy peace partner. Abbas, in turn, has recently reiterated his periodic threat to dissolve the Palestinian Authority–a move that if carried out would presumably give Israel the burden of administering, funding, and coordinating security for the West Bank’s Palestinian population. Libya’s interim leader said on Wednesday that NATO should extend its air patrols over the country through the end of 2011 despite the death and burial of Col. Muammar el-Qaddafi and the formal declaration that the country’s violent revolution was over. The assertion by the interim leader, Mustafa Abdel-Jalil, chairman of the Transitional National Council, appeared to be a tacit admission that armed remnants of Colonel Qaddafi’s defeated disciples could possibly regroup and cause new trouble for Libya in the months ahead. Mr. Jalil spoke as NATO was preparing within days to formally end its operations in Libya, which have been credited with helping anti-Qaddafi fighters topple Colonel Qaddafi’s regime in an eight-month conflict that was the most violent of the Arab Spring uprisings. NATO warplanes also helped flush out Colonel Qaddafi and his subordinates from their final hideaway last Thursday in his hometown, Surt, where he and dozens, if not hundreds, of loyalists were killed, ending his 42-year tenure as one of the Arab world’s most ruthless dictators. Mr. Abdel-Jalil formally declared the conflict over on Sunday, and Colonel Qaddafi, along with one of his sons and former defense minister, were buried in a secret location on Tuesday. “We have asked NATO to stay until the end of the year to protect citizens from Qaddafi loyalists,” Mr. Jalil said at a news conference in Doha, Qatar, where he was attending a meeting of other countries that have assisted the anti-Qaddafi forces in the conflict. NATO ministers last week tentatively set Oct. 31 as the end of their military operations in Libya, which were conducted under the auspices of a Security Council resolution to protect Libyan civilians from reprisals by Colonel Qaddafi’s military during the conflict. The NATO ministers had been scheduled to meet on Wednesday in Brussels to finalize the termination date but abruptly postponed that meeting to Friday, presumably to weigh Mr. Abdel-Jalil’s request for an extension. Qatar, one of the first Arab countries to recognize the coalition of anti-Qaddafi rebels that toppled Colonel Qaddafi’s regime, disclosed for the first time on Wednesday that it had deployed hundreds of soldiers on the ground in Libya to help them. 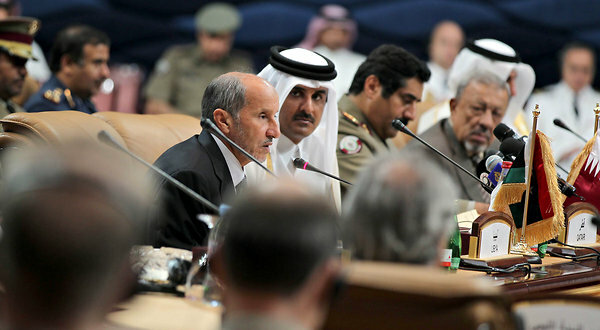 The disclosure came in an interview conducted by Agence France-Presse with Qatar’s military chief of staff, Maj. Gen. Hamad bin Ali al-Atiya, at the Doha meeting. He also was quoted as saying that the Qataris had been “running the training and communication operations” of the anti-Qaddafi forces in Libya. Previously, Qatar had said only that it was providing some air support, water, weapons and hundreds of millions of dollars worth of other aid to the rebels battling Colonel Qaddafi’s military. There were unconfirmed reports from Libya that Seif al-Islam el-Qaddafi, a son of Colonel Qaddafi who was once considered his heir apparent and is still on the run, was seeking to turn himself in at an undisclosed location. But a person close to the Qaddafi family said that he had no knowledge of Seif al Islam’s whereabouts and that his surrender at this time was extremely unlikely. The person spoke on the condition of anonymity to prevent harassment from Qaddafi opponents. Reporting was contributed by Adam Nossiter and David D. Kirkpatrick in Tripoli, Libya. Official results have not been announced, but the Ennahda party said its workers had tallied the results posted at polling stations after Sunday’s vote, the first since the uprisings which began in Tunisia and spread through the region. “The first confirmed results show that Ennahda has obtained first place,” campaign manager Abdelhamid Jlazzi said outside party headquarters in the center of the Tunisian capital. As he spoke, a crowd of more than 300 in the street shouted “Allahu Akbar!” or “God is great!” Other people started singing the Tunisian national anthem. Mindful that some people in Tunisia and elsewhere see the resurgence of Islamists as a threat to modern, liberal values, party officials said they were prepared to form an alliance with two secularist parties, Congress for the Republic and Ettakatol. “We will spare no effort to create a stable political alliance … We reassure the investors and international economic partners,” Jlazzi said. Sunday’s vote was for an assembly which will sit for one year to draft a new constitution. It will also appoint a new interim president and government to run the country until fresh elections late next year or early in 2013. The voting system has built-in checks and balances which make it nearly impossible for any one party to have a majority, compelling Ennahda to seek alliances with secularist parties, which will dilute its influence. “This is an historic moment,” said Zeinab Omri, a young woman in a hijab, or Islamic head scarf, who was outside the Ennahda headquarters when party officials claimed victory. “No one can doubt this result. This result shows very clearly that the Tunisian people is a people attached to its Islamic identity,” she said. Tunisia became the birthplace of the “Arab Spring” when Mohamed Bouazizi, a vegetable seller in a provincial town, set fire to himself in protest at poverty and government repression. His suicide provoked a wave of protests which, weeks later, forced autocratic president Zine al-Abidine Ben Ali to flee to Saudi Arabia. The revolution in Tunisia, a former French colony, in turn inspired uprisings which forced out entrenched leaders in Egypt and Libya, and convulsed Yemen and Syria — re-shaping the political landscape of the Middle East. Ennahda is led by Rachid Ghannouchi, forced into exile in Britain for 22 years because of harassment by Ben Ali’s police. Ghannouchi is at pains to stress his party will not enforce any code of morality on Tunisian society, or the millions of Western tourists who holiday on its beaches. He models his approach on the moderate Islamism of Turkish Prime Minister Tayyip Erdogan. Outside the offices of the commission which organized the election, about 50 people staged a sit-in demanding an investigation into what they said were irregularities committed by Ennahda. Election officials said any problems were minor. Ennahda’s preferred coalition partners may reassure some opponents. Ali Larayd, a member of the party’s executive committee, said it was ready to form an alliance with the Congress for the Republic and Ettakatol, both secularist groups respected by Tunisia’s intelligentsia. The Congress is led by Moncef Marzouki, a doctor and human rights activist who spent years in exile in France. Ettakatol is a socialist party led by Mustafa Ben Jaafar, another doctor and veteran Ben Ali opponent. The only official results released were from polling stations abroad, because they voted early. The election commission said that out of 18 seats in the 217-seat assembly allocated to the Tunisian diaspora, 9 went to Ennahda. Its closest rivals were Marzouki’s Congress on four seats and Ettakatol, which won three. The highest-profile secularist challenger to Ennahda, the Progressive Democratic Party (PDP) conceded defeat. It had warned voters that modern, liberal values would be threatened if the Islamists won. “The PDP respects the democratic game. The people gave their trust to those it considers worthy of that trust. We congratulate the winner and we will be in the ranks of the opposition,” a party statement sent to Reuters said. Ennahda’s win was a remarkable turnaround for a party which just 10 months ago had to operate underground because of a government ban and which had hundreds of followers in prison. In a slick and well-funded campaign, the party tapped into a desire among ordinary Tunisians to be able to express their faith freely after years of aggressively enforced secularism. It also sought to show it could represent all Tunisians, including the large number who take a laissez-faire view of Islam’s strictures, drink alcohol, wear revealing clothes and rarely visit the mosque. Secularist opponents say they believe this is just a cleverly constructed front that conceals more radical views, especially among Ennahda’s rank and file in the provinces. The party’s final election rally last week was addressed by one of Ennahda’s candidates, a glamorous woman who does not wear a hijab. On the fringes of the same rally, stalls sold books by Salafist authors, followers of a strict interpretation of Islam who believe women should be covered up and that the sexes should be segregated in public. 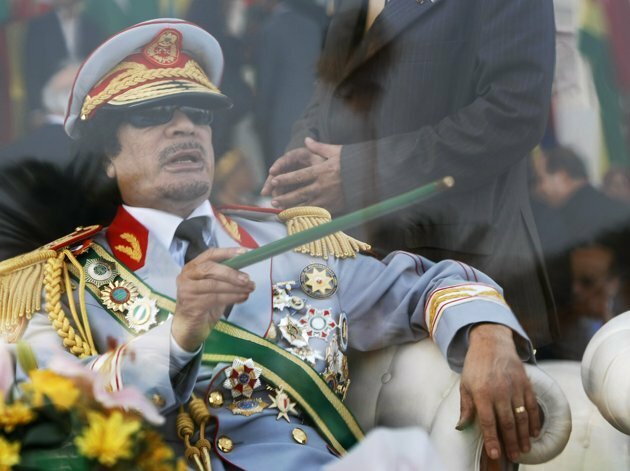 Gaddafi’s death – who pulled the trigger? SIRTE, Libya (Reuters) – Disturbing images of a blood-stained and shaken Muammar Gaddafi being jostled by angry fighters quickly circulated around the world after the Libyan dictator’s dramatic death near his home town of Sirte. The exact circumstances of his demise are still unclear with conflicting accounts of his death circulating. But the footage, possibly of the last chaotic moments of Gaddafi’s life, offered some clues into what happened. Gaddafi was still alive when he was captured near Sirte. In the video, filmed by a bystander in the crowd and later aired on television around the world, Gaddafi is shown being dragged off a vehicle’s bonnet and pulled to the ground by his hair. “Keep him alive, keep him alive!” someone shouts. Gunshots then ring out. The camera veers off. In what appeared to contradict the events depicted in the video, Libya’s ruling National Transitional Council said Gaddafi was killed when a gunfight broke out after his capture between his supporters and government fighters. He died from a bullet wound to the head. It said no order had been given to kill him. Gaddafi called the rebels who rose up against his 42-years of one-man rule “rats,” but in the end it was he who was captured cowering in a drainage pipe full of rubbish and filth. “He called us rats, but look where we found him,” said Ahmed Al Sahati, a 27-year-old government fighter, standing next to two stinking drainage pipes under a six-lane highway near Sirte. On the ground, government fighters and the scenes of sheer carnage nearby told the story of the dictator’s final hours. Shortly before dawn prayers on Thursday, Gaddafi, surrounded by a few dozen loyal bodyguards and accompanied by the head of his now non-existent army Abu Bakr Younis Jabr, broke out of the two-month siege of Sirte and made a break for the west. But they did not get far. France said its aircraft struck military vehicles belonging to Gaddafi forces near Sirte at about 8:30 a.m. (0630 GMT) on Thursday, but said it was unsure whether the strikes had killed Gaddafi. Some two miles west of Sirte, 15 pick-up trucks mounted with heavy machine guns lay burned out, smashed and smoldering next to an electricity sub station some 20 meters from the main road. They had clearly been hit by a force far beyond anything the motley army the former rebels has assembled during eight months of revolt to overthrow the once feared leader. But there was no bomb crater, indicating the strike may have been carried out by a helicopter gunship, or that it had been strafed by a fighter jet. Inside the trucks still in their seats sat the charred skeletal remains of drivers and passengers killed instantly by the strike. Other bodies lay mutilated and contorted strewn across the grass. Some 50 bodies in all. 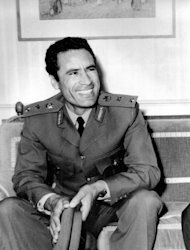 Gaddafi himself and a handful of his men escaped death and appeared to have run through a stand of trees toward the main road and hid in the two drainage pipes. But a group of government fighters were on their tail. “At first we fired at them with anti-aircraft guns, but it was no use,” said Salem Bakeer, while being feted by his comrades near the road. “Then we went in on foot. “One of Gaddafi’s men came out waving his rifle in the air and shouting surrender, but as soon as he saw my face he started shooting at me,” he told Reuters. “Then I think Gaddafi must have told them to stop. ‘My master is here, my master is here’, he said, ‘Muammar Gaddafi is here and he is wounded’,” said Bakeer. “We went in and brought Gaddafi out. He was saying ‘what’s wrong? What’s wrong? What’s going on?’. Then we took him and put him in the car,” Bakeer said. At the time of capture, Gaddafi was already wounded with gunshots to his leg and to his back, Bakeer said. Other government fighters who said they took part in Gaddafi’s capture, separately confirmed Bakeer’s version of events, though one said the man who ruled Libya for 42 years was shot and wounded at the last minute by one of his own men. “One of Muammar Gaddafi’s guards shot him in the chest,” said Omran Jouma Shawan. Another of the fighters who said he took part in the capture toted a heavily engraved a golden pistol he said he took from Gaddafi as he was hoisted on the shoulders of his comrades. Army chief Jabr was also captured alive, Bakeer said. NTC officials later announced he was dead. Fallen electricity cables partially covered the entrance to the pipes and the bodies of three men, apparently Gaddafi bodyguards lay at the entrance to one end, one in shorts probably due to a bandaged wound on his leg. Four more bodies lay at the other end of the pipes. All black men, one had his brains blown out, another man had been decapitated, his dreadlocked head lying beside his torso. Joyous government fighters fired their weapons in the air, shouted “Allahu Akbar” and posed for pictures. Others wrote graffiti on the concrete parapets of the highway. “Gaddafi was captured here,” said one simply. From there Gaddafi was taken to Sirte where he and his dwindling band of die-hard supporters had made a last stand under a rain of missile and artillery fire in a desperate two-month siege. Video footage showed Gaddafi, dazed and wounded, but still clearly alive and as he was dragged from the front of a pick-up truck by a crowd of angry jostling government soldiers who hit him and pulled his hair to drag him to the ground. He then appeared to fall to the ground and was enveloped by the crowd. NTC officials later announced Gaddafi had died of his wounds after capture. Someone in the crowd shouted “keep him alive, keep him alive,” but another fighter cried out in a high pitched crazed scream. Gaddafi then goes out of view and gunshots are heard. Further television footage showed what appeared to be Gaddafi’s lifeless body being loaded into an ambulance in Sirte. An NTC spokesman in Benghazi, Jalal al-Galal, said a doctor who examined Gaddafi when he arrived in Misrata found he had been shot in the head and abdomen. THE HAGUE, Netherlands (AP) — The International Criminal Court issued arrest warrants Monday for Moammar Gadhafi, his son Seif, and his intelligence chief for crimes against humanity in the Libyan leader’s four-month battle to cling to power. Judges announced that the three men are wanted for orchestrating the killing, injuring, arrest and imprisonment of hundreds of civilians during the first 12 days of an uprising to topple Gadhafi from power, and for trying to cover up the alleged crimes. The warrants turn Gadhafi, his son Seif al-Islam Gadhafi and intelligence chief Abdullah al-Sanoussi into internationally wanted suspects, potentially complicating efforts to mediate an end to more than four months of intense fighting in the North African nation. Presiding judge Sanji Monageng of Botswana said Monday there were “reasonable grounds to believe” that Gadhafi and his son are both “criminally responsible as indirect co-perpetrators” for the murder and persecution of civilians. She called Gadhafi the “undisputed leader of Libya” who had “absolute, ultimate and unquestioned control” over his country’s military and security forces. “The ICC has no legitimacy whatsoever. We will deal with it. … All of its activities are directed at African leaders,” government spokesman Moussa Ibrahim told reporters Sunday. “This is the only way to protect civilians in Libya,” said the statement from the office of Chief Prosecutor Luis Moreno-Ocampo. Shortly before the court announced the warrants, French President Nicolas Sarkozy reiterated his call for Gadhafi to step down. In Tripoli, two loud explosions shook the area near Gadhafi’s compound Monday. NATO jets were heard over the Libyan capital minutes after the blasts as sirens from emergency vehicles blared in the streets. The thunderous late-morning blasts were felt at a hotel where foreign journalists stay in Tripoli. Smoke rose from the area near Gadhafi’s Bab al-Aziziya complex, where Libyans hold daily rallies in support of the government. Gadhafi is not believed to be staying in the compound. It wasn’t immediately clear what was hit or if there were civilian casualties. A coalition including France, Britain and the United States began striking Gadhafi’s forces under a United Nations resolution to protect civilians on March 19. NATO assumed control of the air campaign over Libya on March 31 and is joined by a number of Arab allies. TRIPOLI, Libya (AP) — NATO warplanes dashed into the Libyan capital Tripoli at midday Friday, pounding a target in the south of the city and sending a thick cloud of black smoke rising high into the air. A series of explosions rumbled across other parts of the city as fighter jets could by heard flying overhead. Fire engines raced through the streets, sirens blaring. It wasn’t clear what was hit or whether there were casualties. Friday is the main day of rest in Libya, with many people off work. NATO has been ramping up the pressure on Moammar Gadhafi’s regime. Though most airstrikes happen under cover of darkness, daytime raids have grown more frequent. Friday’s raids follow a barrage that struck multiple targets late Thursday night. The fresh strikes blasted the capital as renewed diplomatic efforts to halt Libya’s civil war appeared to be gaining momentum, though there are no signs a breakthrough is imminent. On Thursday, Russia’s envoy to Libya met with senior government leaders in Tripoli, but not Gadhafi himself, in an effort to stop the fighting. Last week, the envoy Mikhail Margelov visited the Libyan rebel stronghold of Benghazi and said that Gadhafi has lost his legitimacy. However, the envoy also said NATO airstrikes are not a solution to Libya’s violent stalemate. Libyan Prime Minister al-Baghdadi al-Mahmoudi said the Libyan government has held a number of “preliminary meetings” with officials based in the eastern rebel-held city of Benghazi. He said the talks took place abroad, including in Egypt, Tunisia and Norway, but he did not provide specifics. A coalition including France, Britain and the United States launched the first strikes against Gadhafi’s forces under a United Nations resolution to protect civilians on March 19. NATO assumed control of the air campaign over Libya on March 31. It’s joined by a number of Arab allies. Speaking by video link from Naples, NATO Wing Commander Mike Bracken said Gadhafi’s future at the helm of Libya was a what he called a “political decision.” Bracken was speaking to reporters in Brussels, NATO headquarters. 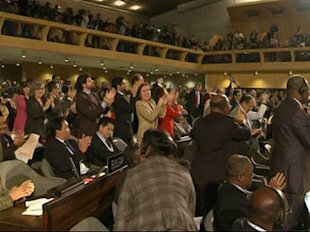 Later, NATO spokeswoman Oana Lungescu said there were no indications Gadhafi would stop attacking the opposition. What started as a peaceful uprising inside Libya against Gadhafi has grown into a civil war, with rebels now holding a third of the country in the east and pockets in the west. Libya’s rebels mark Feb. 17 — four months ago Friday — as the start of their revolution against Gadhafi’s more than four-decade rule. It was on that date that protesters emboldened by Arab uprisings in neighboring Tunisia and Egypt took to the streets in a number of Libyan cities. At least 20 people were reported killed in a crackdown by state security forces. Fighting between government forces and the rebels had reached a stalemate until last week when NATO launched the heaviest bombardment of Gadhafi forces since the alliance took control of the skies over Libya. AP writer Don Melvin contributed from Brussels. WASHINGTON – The White House says the cost of U.S. military involvement and humanitarian assistance in Libya is about $800 million as of early June. Officials estimate the U.S. will spend about $1.1 billion in Libya through the beginning of September. The administration included those cost estimates in a report on the Libya mission sent to Congress on Wednesday. The report is in response to a House resolution that chastised Obama for failing to provide Congress enough information on the scope and cost of U.S. military campaign in Libya. The White House also says in the report that President Barack Obama has the authority to continue U.S. military involvement in Libya even without authorization from Congress. Pushing back against congressional criticism, the White House said Wednesday that President Barack Obama has the authority to continue U.S. military action in Libya even without authorization from lawmakers on Capitol Hill. In a detailed, 30-page report being sent to Congress, the administration argues that the U.S. has a limited, supporting role in the NATO-led bombing campaign in Libya. Because U.S. forces are not engaged in sustained fighting and there are no troops on the ground there, the White House says the president is within his constitutional rights to direct the mission on his own. The administration’s defense of the Libya mission comes in response to a non-binding House resolution passed earlier this month that chastised Obama for failing to provide a “compelling rationale” for U.S. involvement in Libya. The resolution gave the administration until Friday to respond to a series of questions on the mission, including the scope of U.S. military activity, the cost of the mission, and its impact on other U.S. wars in Iraq and Afghanistan. It remained to be seen whether the administration’s reasoning would be enough to quell congressional criticism. House and Senate leaders grew frustrated Wednesday when the White House briefed reporters on the report well before sending it to Congress. Obama did not seek congressional consent before ordering U.S. airstrikes against Moammar Gadhafi’s forces nearly three months ago. Despite that, the White House has maintained that the president is not in violation of the 1973 War Powers Resolution, which prohibits the military from being involved in actions for more than 60 days without congressional authorization, plus a 30-day extension. House Speaker John Boehner, R-Ohio, sent Obama a letter this week stating that the 90-day window runs out on Sunday. However, senior administration officials previewing the report Wednesday said U.S. forces are not involved in the kind of “hostilities” for which the War Powers Resolution says the commander in chief must get congressional approval. While the U.S. led the initial airstrikes on Libya, NATO forces have since taken over the mission, which is in its third month. The U.S still plays a significant support role that includes aerial refueling of warplanes and intelligence, surveillance and reconnaissance work. The White House and Capitol Hill have been at odds throughout much of the three-month campaign over whether the administration has fully consulted Congress on the mission. Congressional leaders and key committee members were only summoned to the White House the day before Obama ordered air strikes against Gadhafi’s forces. Several lawmakers attended in person, others by phone as Congress had just begun a weeklong break. Obama aides insist they have briefed Congress extensively throughout, citing more than 30 briefings with lawmakers and their staff, and 10 hearings where administration officials have testified on Libya. The White House has called the House resolution chiding Obama, as well as a similar resolution in the Senate, unhelpful and unnecessary. The administration much prefers a resolution sponsored by Sens. John Kerry, D-Mass., and John McCain, R-Ariz., that would signal support for the Libya operation. However, the fate of that measure is in limbo as the Senate Foreign Relations Committee delayed plans to discuss so lawmakers could review the House report. A bipartisan group of 10 lawmakers also sued Obama on Wednesday for taking military action against Libya without war authorization from Congress. The lawmakers said Obama violated the Constitution in bypassing Congress and using international organizations like the United Nations and NATO to authorize military force. White House spokesman Jay Carney said Wednesday that the president expects congressional support for the Libya campaign will continue. With Gadhafi under pressure to leave power, he said now is not the time to send “mixed messages” about U.S. commitment to the campaign. TRIPOLI, Libya – A NATO airstrike hit an area near Libyan leader Moammar Gadhafi’s compound in the capital again Tuesday, as military leaders voiced concerns about sustaining the operations if the alliance mission drags on. A column of gray smoke could be seen rising from the area around Gadhafi’s Bab al-Aziziya compound shortly before dawn Tuesday. The concussion from the blast was felt at a hotel where journalists stay in the capital. It was not clear what was targeted, and Libyan officials didn’t immediately comment. East of the capital, alliance aircraft have begun dropping leaflets warning government troops to abandon their posts outside Zlitan, which lies just west of the rebel-held port city of Misrata. Rebel forces have been advancing along the Mediterranean coast toward Zlitan, but say they have been instructed by NATO to withdraw ahead of expected bombing runs to old front lines in Dafniya. An Associated Press reporter near the front line said NATO fighter jets were be heard overhead. If the rebels take Zlitan, they would be within 85 miles (135 kilometers) of the eastern outskirts of Tripoli. A rebel official said opposition leaders in Zlitan have been meeting with their counterparts in Misrata, but he acknowledged they face challenges in advancing on the city. “We need the people of Zlitan to push more courageously forward. They are dependent on our movements, but the problem is only a third of that city is with the rebels,” said Ibrahim Beatelmal, a rebel military spokesman in Misrata. NATO’s nearly three-month air campaign has grounded Gadhafi’s air forces and weakened his military capabilities. But there are signs the pace of operations has put a strain on the trans-Atlantic alliance. In London, the head of the Royal Navy warned that the British fleet — a key contributor to the Libya mission — will be unable to maintain the pace of operations if the mission drags on until the end of the year. “If we do it longer than six months we will have to reprioritize forces,” he said. Elsewhere, a senior NATO official said coalition resources would become “critical” if intervention in Libya continues. “If additional resources are needed, this of course will need a political decision,” said the official, Gen. Stephane Abrial, Supreme Allied Commander Transformation. U.S. Defense Secretary Robert Gates last week publicly rebuked the United States’ European allies and said NATO’s operations in Libya have exposed the alliance’s shortcomings. France and Britain have carried most of the load since NATO began the Libya mission March 31. In western Libya, Gadhafi’s troops were bombarding opposition forces controlling a key border crossing with Tunisia, according to Omar Hussein, a spokesman for rebels in the western Nafusa mountains. He said government forces were targeting rebels holding the road that leads toward the Dehiba border crossing. Dehiba is a key supply point for the rebels who wrested control of a string of Nafusa mountain towns from Gadhafi’s forces earlier this month. NATO, meanwhile, reported it had carried out 62 airstrikes on Libya Monday, hitting military targets in Tripoli and four other cities in Gadhafi controlled territory. The alliance has considerably stepped up the pace of air attacks over tjhe past several days. Al-Shalchi reported from Misrata. Maggie Michael in Cairo and Danica Kirka in London contributed reporting. MISRATA, Libya – Government artillery rained down on rebel forces Monday but failed to stop their advance into key ground west of their stronghold at Libya’s major port. As fighting raged for a fourth day, Germany’s foreign minister paid a surprise visit to the rebel’s de facto capital. That position is similar to that of the United States, which has stopped short of outright diplomatic recognition of the council. The move was, nevertheless, another big diplomatic boost for the rebels and their four-month uprising to end Moammar Gadhafi’s 40-year rule in the oil-rich North African country. Germany refused to participate in the NATO air mission over Libya and withheld support for the no-fly zone. The rebels control roughly the eastern one-third of Libya as well as Misrata, the country’s major port. The also claim to have taken parts of coastal oil center of Zawiya in the far west. That port city is 18 miles (30 kilometers) west of Tripoli and a prize that would put them in striking distance of the capital. Control of the city also would cut one of Moammar Gadhafi’s last supply routes from Tunisia. Despite rebel claims, government spokesman Moussa Ibrahim said late Sunday that Gadhafi forces had driven off the attackers, and reporters taken to Zawiya saw secure streets and the green national flag flying over a central square. The insurgents, for their part, claimed a high-ranking Gadhafi commander was badly wounded in the fighting. “The wishful reporting of some journalists that the rebels are gaining more power and more control of some areas is not correct,” he said. In the major fighting near Misrata on Monday, an Associated Press photographer at the rebel front lines said they had pushed along the Mediterranean Sea to within 6 miles (10 kilometers) of Zlitan, the next city to the west of Misrata. A rebel commander said his forces, using arms seized from government weapons depots and fresh armaments being shipped in from Benghazi, planned to have moved into Zlitan, by Tuesday. Ali Terbelo, the rebel commander, said other opposition forces already were in Zlitan, trying to encircle Gadhafi troops. If the rebels take the city they would be within 85 miles (135 kilometers) of the eastern outskirts of Gadhafi’s capital, Tripoli. Officials at Hikma Hospital in Misrata said government shelling killed seven and wounded 49 on Sunday. New casualty figures were not available but ambulances were rushing from the Dafniya line back into Misrata. The rebel thrust at Zawiya and movements farther east — near Misrata and Brega — suggested the stalemated uprising had been reinvigorated, and that Gadhafi’s defenders may become stretched thin. Rebels encountered a major setback, however, near the eastern oil town of Brega on Monday. Suleiman Rafathi, a doctor at the hospital in the town of Ajdabiya where the casualties were taken, said 23 rebels were killed and 26 wounded in a government ambush about 22 miles (35 kilometers) east of Brega. The front lines between Brega and Ajdabiya have been relatively quiet in recent weeks, while fighting has raged in western Libya. Rebel fighters appear to be rebounding with help from the NATO blockade of ports still under government control and alliance control of Libyan airspace. Both have severely crimped the North African dictator’s ability to resupply his forces. And his control has been hard hit by defections from his military and government inner circle. U.S. Secretary of State Hillary Rodham Clinton spoke again against the Libyan regime, telling the nations of Africa on Monday to sever links Gadhafi despite his long support and patronage for many African leaders. In a speech on Monday to diplomats at the African Union headquarters in Addis Ababa, the Ethiopian capital, Clinton said Africa should join most of the rest of the world in abandoning Gadhafi. She said the Libyan leader has lost all legitimacy to rule because of attacks on his own citizens. She’s urged all African leaders to demand that Gadhafi accept a ceasefire and then leave Libya. She also said they should expel pro-Gadhafi Libyan diplomats from their countries, suspend the operations of Libyan embassies and work with the Libyan opposition. The rebel council also won recognition from the United Arab Emirates, adding a wealthy, influential Arab state to the handful of nations thus far accepting the insurgents as Libyans’ sole legitimate representatives. In a lighter moment, the Libyan leader was shown playing chess with the visiting Russian head of the World Chess Federation. The federation is headed by the eccentric Kirsan Ilyumzhinov, who until last year was the leader of Russia’s predominantly Buddhist republic of Kalmykia. He once claimed to have visited an alien spaceship. Libyan state television showed Gadhafi, dressed all in black and wearing dark sunglasses, playing chess Sunday evening with his Russian guest. Russia’s Interfax news agency quoted Ilyumzhinov as saying Gadhafi told him he has no intention of leaving Libya despite international pressure. It was unclear where the chess game took place. Gadhafi’s compound in the center of Tripoli has been under NATO bombardment and was hit again Sunday. Gadhafi had not been seen in public since mid-May, and Ilyumzhinov told him how pleased he was to find him healthy and well.